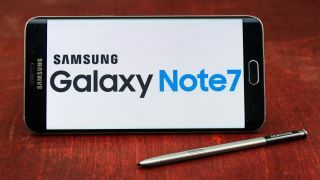 Cross out Samsung Galaxy Note 6 with your S-Pen and jot down the new name: Samsung Galaxy Note 7. It's reportedly launching in a month along with a brand new biometric feature. The Note 6-skipping name is so future-forward that it'll include an iris scanner, according to notable phone leaker Evan Blass. If true, this will allow you to unlock the new Android phone with your eyes. The Galaxy Note 7 name and iris scanner news are both a surprise for the phablet series, which typically takes cues from Samsung's flagship S series, but adds a bigger screen and stylus. But, truth be told, the Note 6 name would automatically sound inferior to the Samsung Galaxy S7 and Galaxy S7 Edge to many consumers. That's just not the case given the rumored high-end specs. More importantly, it might be deemed as inferior to the equally unconfirmed iPhone 7 and iPhone 7 Plus. There's no way that the South Korean company wants that for the Samsung Galaxy Note 7. Even though the name may have changed, the Samsung Galaxy Note 7 release date remains on track for August 2. Samsung hasn't confirmed it, but we've heard it's pretty much a lock from multiple sources. That's when we expect to see a large and curvy Android phone with a 5.7-inch Quad HD Super AMOLED display. A flat Note isn't in the cards, but the return of a microSD card slot and IP68 water-resistance is. It's all about power with the Samsung Galaxy Note 7. It's set to include 6GB of RAM and 64GB of internal storage to match the OnePlus 3, but one-up it by debuting the new Snapdragon 823 processor. We don't anticipate the Note 7 to have a removable battery. Thankfully, it's allegedly carrying a healthy 4,200mAh battery capacity, along with a 12MP camera carried over from the S7 Edge. There's bound to be a lot of excitement regarding the Samsung Galaxy Note 7 iris scanner. Unlocking your phone just by looking it is a some sci-fi-level... stunt work. It'll be interesting to see how the company is able to improve upon current eye-initiated biometric scanning in phones. I tested out iris scanning in the Microsoft Lumia 950 and saw it was a neat, but ultimately slow. I recently talked to the team behind the ZTE Axon 7, asking them why it doesn't include iris scanning when the ZTE Grand S3 did. The answer was that the technology isn't fast enough for phones to be practical. It's true. That's the hurdle that the Samsung Galaxy Note 7 needs to overcome. Iris scanning is a neat party trick, but we won't need another worthless idea like the eye-controlled Samsung Galaxy S5 smart scroll. Remember that wonky feature you dug deeply into the multi-layered TouchWiz settings to turn off? There's also concern over that huge Note 7 screen that Samsung's bigger phones are known for. Having an Edge-only display might further complicate false touches along the sides. What's the plan there? There's obviously a lot to uncover on August 2. Stand by for more news on what could potentially be one of the best Android phones. It's more than potentially going to shake up the conventional Note series.